FROM A 2002 W203 C CLASS. AUTO DIMMING REAR VIEW MIRROR. MODEL: C KLASS S204. COLOUR: SILVER CODE : C723. BODY TYPE: 5 DOOR ESTATE. ALWAYS COMPARE PART NUMBER. ON THEM IN FORM OF SCRATCHES. TOP QUALITY CAR PARTS. YEAR: 2008. TO CHECK IF. We provide a wider range of quality vehicle salvage, salvage car parts & used vehicle parts. ALL PARTS ARE SECURITY MARKED AND PHOTGRAPHED FOR EVIDENCE PRIOR TO DESPATCH. An item has been previously used. Body style5 DOOR HATCHBACK. ModelA Class. Number of gears6. Number of seats5. Number of doors5. AS WE DO COUNTER SALES AT OUR PREMICES THERE IS A POSSIBILITY THAT THE PRODUCT IS SOLD AT THE COUNTER. PART NUMBER NUMBER OF DOORS Specialist in new and used car parts. All requests will be processed after we have inspected and verified the condition of the Products. All type of cars always wanted for breaking. 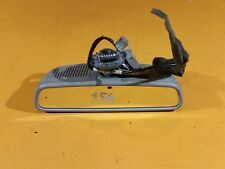 MERCEDES C205 C220D INTERIOR REAR VIEW MIRROR 2058100817. MERCEDES A-CLASS W176 INTERIOR REAR VIEW MIRROR WITH LIGHT A1768100617 PLEASE VIEW ALL PHOTOS FOR ITEM CONDITION PLEASE NOTE: THE COMPATIBILITY TABLE IS FOR REFERENCE ONLY AND NOT A GUARANTEE THE PART WILL FIT YOUR VEHICLE. IF YOU'RE IN DOUBT SPEAK WITH YOUR MECHANIC AND COMPARE THE PART NUMBER (WHERE APPLICABLE) OR CONTACT US BEFORE YOU ORDER TO AVOID UNNECESSARY RETURNS. S320 3.2 Petrol Automatic W220. Interior Mirror. This part was removed from a Right Hand Drive Vehicle. Compatibility is a guide only. Your item will need to be signed for. Part Number. In good working order, has a scuff mark as shown. REMVED FROM E220 CDI W122 SALOON 2010 WITH 72,000 MILES VIN NO: WDD21220022A308531. Model: s500. Colour: Gold. Year: 2000. Fuel type: Petrol. Engine: 5.0 v8. 2006 Mercedes-Benz M Class 2005 To 2008 ML350 Sport 3.5 7 Speed Automatic Petrol 5 Door 4x4 Mirror Rear View With Part Number: This part was removed from a vehicle with the engine code: M272.967 All of our mechanical and electrical parts come with a 3 month warranty as standard, this covers the part itself but does not cover any labour charges incurred from fitment or removal of the item. (Terms and Conditions Apply). For extra peace of mind, extended warranties are available upon request at an additional charge. For more information please message us. Please be aware that all our items are removed from right hand drive vehicles unless otherwise stated. If you are unsure if this item will fit your vehicle or if you have any other questions then please call our parts department who will be happy to help. FROM C CLASS W204. Part number N/A. We are gladly at your service for any further queries. Goods will only be dispatched upon cleared funds. Mon - Fri 9:00 - 18:00. Key Features. (Except Malta, Cyprus, Canary Islands). This listing is for the pictured rear view mirror removed from a 2013 Mercedes-Benz C Class. The Mirror is in good used condition but may have a few minor marks on. If you are unsure about fitment to your vehicle please send us a message / enquiry. 140 s class auto dimming interior mirrorItem Colour GreyRemoved from a S600 V12. Important Information. PART NUMBER: 220811007. MODEL: S-CLASS W220 S500L. Compare part nr to find out it is the right part for your car. TOP QUALITY AUTO PARTS. YEAR: 1999. ASK BEFORE YOU BUY IF YOU ARE NOT SURE IT IS THE RIGHT ITEM. For Sale is a Interior Mirror. Removed from a 2016 MERCEDES 218 CLS CLASS 2987cc Diesel 4 Door Coupe. Please see item description for more information, you will receive everything you see in the images. FROM A CLASS W168. Key Features. We are gladly at your service for any further queries. Part number N/A. Goods will only be dispatched upon cleared funds. (Except Malta, Cyprus, Canary Islands). Removed from a 1996 E220 Cabriolet. Average/Poor condition. An item has been previously used. Body style4 DOOR SALOON. ModelS Class. Number of gears7. Number of seats5. Number of doors4. Version date to2009-08-01. Version date from2006-01-01. MODEL:W203 C-CLASS C200 CDI. BODY TYPE: 4 DOOR SALOON. COLOUR: BLACK PAINT CODE 197. Compare part nr to find out it is the right part for your car. on them in the form of. TOP QUALITY AUTO PARTS. YEAR: 2004. INTERIOR REAR VIEW MIRROR. PART NUMBER A 164 810 10 17. WE AIM TO RESOLVE ANY ISSUES WITHIN 24 HOURS. IF THERE IS A PART YOU ARE LOOKING FOR AND YOU CAN NOT FIND IT.